For orthodontic treatment plannning and airway disorder diagnosis. Advanced dental imaging allows orthodontists to visualize important areas in your mouth, bone structure, and skull to determine treatment planning. A Los Angeles Cephalometric X-Ray examination could be an imperative radiograph to have so that dentists and patients get the appropriate care for their teeth. The x-ray exposure is rather quick, taking less than 10 seconds to scan your head with the actual x-ray taking 5 minutes to develop. 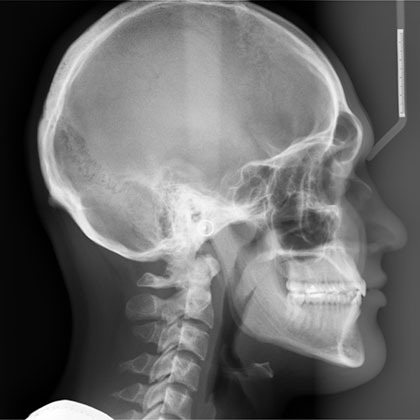 The Los Angeles Cephalometric X-Ray is used to predict how your bone structure and jaw would be affected by orthodontic treatment. Essentially, this radiograph is used mostly for treatment planning so that dentists can navigate through your mouth and have an idea of the response of your bone and jaw anatomy from treatment Thus, it is important that you find an advanced dental imaging center that specializes in Los Angeles Cephalometric X-Ray radiographs for your own health. Usually, patients require at most two Los Angeles Cephalometric X-Ray appointments, one before treatment and one after so your orthodontist can determine if any part of your mouth anatomy as affected. Since you’ll be using this radiograph twice, it would be wise to find an advanced dental imaging center that you and your orthodontist trusts to get optimal x-rays. Even if your dentist refers you to an orthodontist, it is recommended to also conduct your own research of the imaging center so that you feel comfortable with the process. At LA Imaging, we understand the tremendous value of having advanced dental imaging for our patients. Local dentists recommend our Los Angeles Cephalometric X-Ray to patients in Beverly Hills as well as the San Fernando Valley because our devices, staff, and expertise are second to none in the county. We believe our Los Angeles Cephalometric X-Ray service will provide your dentist with the best radiographs to determine your treatment. We understand that radiographs can be uncomfortable for some, and our staff is trained to make your experience as enjoyable as possible so you can have healthy teeth. If you are in need of advanced dental imaging like Los Angeles Cephalometric X-Ray, ask your dentist about LA Imaging, or you can schedule an appointment at either our Beverly Hills or Encino today!